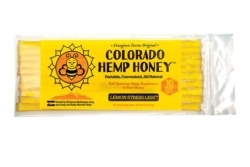 We have paired pure and raw honey with Colorado grown full spectrum hemp extract to create a superfood of the highest quality. The addition of organic lemon essential oil creates a fresh, cool, slightly tart lemon essence that sharpens the mind. These infusions create synergies that surpass the benefits of consuming each food individually. • Start with 1 stick and wait 30 minutes before consuming another to gauge how your body metabolizes the cannabinoids.